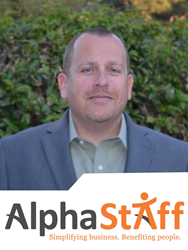 AlphaStaff, a leading HR outsourcing firm and professional employer organization, has appointed Harry Glazer as vice president of business development for its new California and West Region office. Glazer will focus on developing the company's relationships with key broker referral sources, including the exclusive relationship formed with general agency Word & Brown, from AlphaStaff's new Escondido-based expansion office while seeking new business opportunities to support AlphaStaff's growth and expansion efforts on the West Coast. "We are thrilled to welcome Harry to our team. His experience, business knowledge and understanding of the PEO and HR Outsourcing industry and values are a perfect fit for our organization," AlphaStaff President & CEO Kyle R. Kelly said. Glazer is an experienced business development professional with a history of sales and marketing excellence in the PEO industry. He started his career in the Human Resources industry as a sales representative with the third largest PEO in the Arizona market where he found tremendous success and ease in navigating the challenging PEO sales process. He recommended valuable changes to the sales process, marketing materials, and soon began training and conducting management related activities. He was then recruited to start Accurate Outsourcing, a startup local PEO; growing that company to 2,200 lives in 18 months. Accurate was eventually acquired by North Carolina based Insource Employer Services. Shortly after this acquisition, Glazer went on the become vice president of sales & marketing for Creative Business Resources, another PEO in the Phoenix market. Glazer brings ten years of diverse PEO experience with a successful track record of profitable and long lasting client relationships. Having a keen understanding of and uncompromising commitment to client relationships and customer service, Glazer will be the first to offer a solution or roll-up his sleeves to get a job done; usually with a smile on his face. He attributes a large portion of his success to his unwavering commitment to following through on his commitments to his clients and strategic partners. “In this industry, relationships are everything! No one person or one company can do it all…it is a collaborative effort and we must be willing to lend a hand, regardless of the gain or rewards reaped,” states Glazer. AlphaStaff is a leading professional employer organization that delivers a customizable suite of human resource, employee benefit and employee administration solutions designed to support organizations through their evolving business cycles. Through the buying power of more than 1,000 companies and tens of thousands of worksite employees, clients gain access to workforce management expertise, practical benchmarking data, HR information systems, insurance and the ability to realize a more predictable health care expense. AlphaStaff delivers measureable results ensuring clients achieve their objectives related to cost management, efficiency, compliance and profitability. AlphaStaff, founded in 1997, has supported more than 100,000 worksite employees in 49 states. For more information, visit http://www.alphastaff.com.